Ece Temelkuran is described first and foremost as a journalist and political commentator on her website. Embroiled at an early age in the midst of a multitude of violent coups and uprisings, Temelkuran has spent most of her life trying to fight corruption and shedding light upon the daily struggles of the common people. She has travelled all over the world. 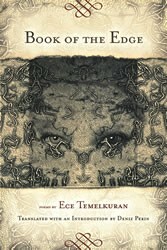 It is within this wide scope of experience that she crafts her poetry collection, Book of the Edge. The book plays out like a long interconnected narrative that utilizes poetic conventions to tell its tale. Temelkuran’s journalistic training is strongly evident as her images are very concise. There are even instances in which she forgoes verse entirely in favor of prose paragraphs, but that may be the strongest asset to the work as a whole. The story is incredibly compelling. Because the allegories and metaphors are well-grounded, readers can focus less on exploring esoteric themes and instead lose themselves in this journey of self-discovery. The book contains six sections (divided by the motivations for embarkation, the journey itself, and the return home). The first section, titled “Necessary Things for Any Journey,” acts as the speaker’s introduction: a hand outstretched to the reader. The speaker describes feelings of entrapment: “the crowd suppressed the warm, familiar voices inside of me” and “you would be satisfied / with a tiny empire of playpens and narrow rooms. / You would be at ease. / But you are not at ease”. The reader is drawn into a universal feeling of restlessness. It only subsides when the speaker experiences the unvarnished life of the natural world in the next two sections. Here, different species of animals are used as conceits which bring to mind the world the speaker has left behind. A butterfly points out the temporality of wealth, a bull is a meditation on responsibility of power, and albatrosses are incredibly touching examples of love and commitment in an era of absolute freedom. Each of the creatures that the speaker finds reflects some quintessential aspect of the the human condition and serves as a liberating counterpoint to the section that follows. This section, involving the city, is profoundly disturbing as it critiques the vampirism of modern society in a series of four parts called “Plays.” City-dwellers are described as jaguars in “Second Play”, as they lurk through the city streets and hunt outsiders who have not fully conformed to their hollow lifestyle. “First Play” depicts people in the process of conforming, explaining how city-goers keep their eyes lowered to the ground so as to not display their uniqueness. Finally, the speaker leaves the corrupt city and metamorphizes into a sow bug to ruminate on her entire journey, curling herself into a ball. The outside world admires her journey but cannot understand it until the narrator passes along the information in “House of the Edge” on the “…snow white paper”. Temelkuran seems to describe the experience of crafting one’s own story in the final few poems. This creates a sense of empathy with the reader and so it is fitting that the story begins and ends with two versions of the poem “Offering”. The first builds a sense of connection between the reader and narrator: “O reader! You? You are like this, too. / You may not know it yet: You are just like me.” At the end of the journey the narrator reverses that sentiment: “O reader! Me? I am like this, too. / I may not know it yet: / I am just like you.” Temelkuran’s first “Offering” has the narrator describe herself by saying “I am water. I am afraid of the stones I will strike as I flow.” In the second “Offering” the narrator states: “You are water. You are afraid of — and for — the stones you will strike as you flow.” The narrator acknowledges that the fear she once felt can be overcome. It is a rousing and inspiring send-off because the reader now knows that such a feat is possible. This sense of empowerment is what makes Book of the Edge such a captivating read. Translator Deniz Perin perfectly captures the essence of Temelkuran’s journalistic training. The images are concise and the language straightforward. Perin states in the introduction that she had problems translating the Turkish concept of the universal pronoun for men, women, and objects, and Temelkuran wanted the narrator to be as genderless as possible. Luckily, the narrator is only referred to in the third person once, and Perin gives her a feminine pronoun as a “universal she,” which works quite well for the book as a whole.